Kate’s quilt is a tribute to her mother’s role at Bletchley Park during the Second World War, and she describes how she designed and made the quilt to include elements relating to her mother’s history and the theme ‘code breaking’. She later explains how she was inspired by a Jane Austen quilt in Liberty’s, York to have a go at quiltmaking, progressing through workshops (including an interesting log cabin one) and how quilting is now her main hobby. She describes her sewing room and explains how she likes to design and make different types of quilts. Kate also talks about The Quilters’ Guild collection, her love of North Country wholecloth quilts and winning first prize for a group quilt at the Loch Lomond Quilt Show. Glenda Smith [GS]: Good morning Kate. Thank you for agreeing to talk to me today. 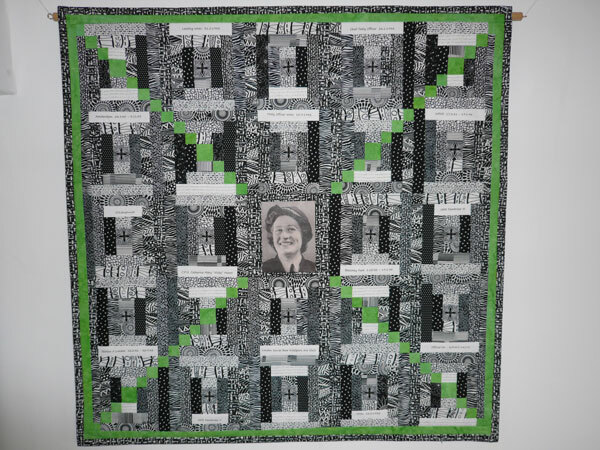 My name for the tape is Glenda Smith and I’m about to interview Kate Smith [laughter] and she has brought with her today a quilt of her mother, that she’s made about her mother which she will tell you about later. Now Kate as you know we are making a record, an oral record of ordinary quilters and their stories, how they started quilting and what happens to their quilts and the sort of things they make. So will you tell me please about… Oh I’m supposed to have the date as well. The date today is the 16th July 2014. So, Kate will you tell me please something about this lovely quilt of yours? GS: Yes it is absolutely gorgeous. Why have you done it in these particular colours? KS: I did it in black and white because the photograph is a black and white photograph and my personal work I do not like black and white photographs in coloured quilts. I think they tend to look very flat and I don’t like them. So I did it in a variety of black and white and some of the logs in the log cabin are printed with details of the history of her ranks and postings during the war which I knew and found out and I printed those myself. And there’s black and white bits that look like code and in fact they are Morse code, which again I printed and it’s the transcription of her service history into Morse code and printed. And I just thought that the black and white fabrics and printing looked much better with the black and white photograph and, but it looked a bit flat so lime green is quite a favourite colour of mine, I think it gives a zing and the X is one of the names for Bletchley Park before it became the code breaking centre was known as Station X. So I just thought the X would give it the lift and it was part of the history of Bletchley as well as my mother’s history. GS: That’s a wonderful idea. So you actually printed this Morse code? GS: What a clever idea. GS: Didn’t they? I didn’t know that. KS: No, no, the code that they were using was the German Enigma. GS: Oh yes, it was but they weren’t sending messages then via Morse code? KS: They may well have used Morse code but that wouldn’t have been what she was working on. KS: But Morse code is a code that everybody knows and it’s … What I actually did was find a website on the Internet where you can type in plain text and it translates it instantly for you into all the dots and dashes and in fact it plays it, if you’ve got the sound on, on the computer, it plays it at the same time so you can hear it going ‘bleep, bleep, bleep’. KS: And then the translation to Morse code I just saved as a document, a Word document and printed it in the same way as I printed the ordinary text. GS: Yes so what did you use for printing these? KS: I just used my ordinary computer printer. GS: Yes but with some fabric? KS: No what I did was I got, it’s just plain white fabric and I stabilised the fabric with some freezer paper, some iron-on freezer paper so it was stiff and just fed it through the printer. So it isn’t printed with any of the ink jet printers because I think they make it quite hard. It’s just printed straight with an ordinary printer and then just ironed it and it sets it. KS: So that works quite well. GS: Yes it does I didn’t realise that you’d actually printed out this fabric. [KS: Yes] [Laughter]. I mean I can see some of the words and obviously the photo of your mum that you’ve printed out. That’s really wonderful. So it was in the exhibition, and then what’s happened to it since? KS: What’s happened to it since is that it’s… I belong to a couple of quilt groups in York so it has been on display in exhibitions of the quilt group and it has been quite a talking point. KS: Lots of people… and although the photograph of my mother is not how I remember her, obviously I remember her much older and very slim and in this photograph she’s smiley and young and quite round-faced and people have said ‘I recognise, they can see the similarity and so at our Priory exhibition quite a few people came up to me and said ‘Oh I recognise the quilt’ and so it has been has been quite a talking point when it’s been… and if I’ve given a talk on quilting I’ve taken it so it has been quite a talking point. KS: So I can see her looking down at me when I’m sewing [laughter]. GS: So will you tell me now please about your interest in general in quiltmaking? KS: Well, as I’ve just mentioned I used to sew with my mother. We used to do dressmaking, didn’t have any history of quiltmaking in the family at all. And although I was born and I’ve lived most of my life in Yorkshire and have developed an interest in North Country quilting, it wasn’t something that I was ever aware of. My grandmother, who lived in the same village as we did, also sewed so I was brought up sewing, but not knowing anything about quilting and I came to live in York five or six years into my marriage and was in Liberty’s one day, buying fabric for dressmaking and there was a quilt hanging there and it was a Jane Austen, a replica of a Jane Austen quilt. I don’t know if you remember that. GS: Mmm I do, yeah. KS: And they had all the fabric there and I looked at that and thought ‘ooh this is something different. I could have a go at this’ and went home and had a think about it and then went back and bought a book and made a quilt. Didn’t read the book properly and have to say the quilt is an absolute hoot, because it’s a block quilt but each block is a foot square. I hadn’t realised that you made lots of blocks and duplicated it so. I hadn’t read that properly and what I then did was do a little bit of quilting and went to some classes in York with someone who taught hand quilting and learned hand quilting. And then when I came to finish full-time work and worked part-time I signed up for a quilting class at Askham Bryan College and learned how to do it properly [laughter]. And then from there I’ve always been interested in quilting. GS: So roughly what year? KS: That would be about, probably now about 1990. KS: When I first saw the Jane Austen quilt, would I think be about 1985 and then by about 1990 I was starting to take classes. GS: Mmm excellent, yes. How many hours would you say you spend quilting today, nowadays? KS: Actually making quilts probably not as many as I used to do because I have become involved in The Quilters’ Guild, and so I would definitely say that quilting is my main hobby but it wouldn’t always be sitting at the sewing machine quilting, but as many as I can fit in [laughter]. And I will quilt by hand so if I’m sitting listening to the radio or watching the television I will probably be doing it by hand as well. KS: Thinking about it, yep, maybe doing samples for some teaching or talking about it, things like that. GS: So does your quiltmaking have any impact on your family life? KS: Only in that since my husband’s retired, he finds that most of my days when he was at work were not doing things that he thought I was doing. They were up in my… I have a…lucky enough to have a house three floors tall, top floor is my sewing room and most of my time is spent up there. So, no it doesn’t, in that during the day we both do our own things. Quite often if we’re going away we will just happen to find ourselves in the vicinity of a [laughter] quilt shop or a quilt exhibition or something like that. GS: Tell me, have you ever used quilts to get through a difficult time in your life? KS: I haven’t, but I know lots of people that have. I suppose I haven’t been, I’ve been lucky enough not to have any really difficult times but I do find quilting, especially handwork, quite therapeutic. [GS: Yes.] So it’s lovely if I’m thinking about something or… my father’s still alive, my father’s now 92 and obviously, y’know, there are problems thinking around him and I can go and spend an afternoon quilting and completely forget about that. But I do know that lots of people do find it helps them at difficult times. GS: And what about the other side of the coin, amusing experiences. Have you had any of those when you’ve been quilting or teaching or anything to do with your quilting? KS: A chainsaw, and he’d seen ‘Log cabin class’ and he’d signed up for it and had… because it was at Askham Bryan College which is an agricultural college, he’d thought it was how to make a log cabin. That was really, really funny [laughter] I think that’s the funniest one [laughter]. GS: So what would you say you find the most pleasing thing about quilting? KS: I enjoy the creative side, I like to see something that I’ve actually made with my own hands and had to think about and I think a lot of people underestimate the skill that’s needed to make a good quilt. I think they sort of downgrade it and when they try for themselves it’s quite… it’s quite an eye-opener for some people. And I enjoy the social side I think it’s a very good hobby, craft, art for bringing people together at all levels and so people can be quite novice and people can be quite experienced and they relate together and 95 per cent, 99 per cent of the time can find a lot in common and get on and I think nice people quilt [laughter]. I think quilters are lovely people. GS: Absolutely. So are there any aspects of quiltmaking that you don’t enjoy? KS: I don’t… I love hand quilting, these days I do not enjoy quilting big bed quilts. I find it a real struggle on a, on a domestic machine. I’m not the best quilter in the world and I have been known to make a quilt and then think… I’ll make a piece of work and then think I’ve ruined it by quilting it so I am very happy these days to sit and do what I enjoy which is the designing and piecing and if it’s a big quilt to send it to somebody else who is much better than I am [laughter]. GS: You mentioned earlier that you belonged to a couple of groups. Which are the local groups? Any groups? Which groups do you belong to? KS I belong to two groups in York. 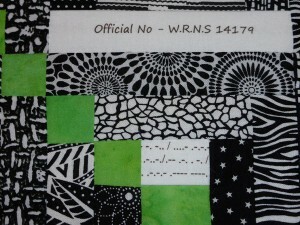 The one that I’ve belonged to longest is a group called the White Rose Quilters. They meet just round the corner, in the centre of York, just round the corner from where I live and that’s a group that’s been going for over thirty years although I haven’t belonged to it. And I belong to another quilting group called Priory Patchworkers which meets just outside York and some people belong to both groups and again that’s quite a long established group and they’re good groups, they’re mixed ability groups, they’re very friendly groups, they’re groups that work towards exhibitions and they have lectures and speakers. And then, of course, I belong to The Quilters’ Guild. GS: Yes. And have any advances in technology influenced the way you quilt? 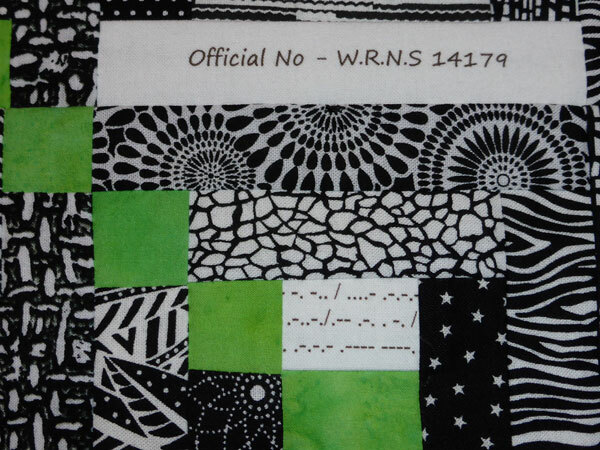 KS: Yes, I have just made a piece which is going into the ‘Finished stash’ challenge, which is an appliqué quilt and it is made using Bondaweb, which is a fusible web [GS: Yes] and some of the pieces are cut using a die-cutter. So instead of cutting them by hand, its big appliqué flower heads and the leaves are actually cut with a die-cutter, so that was relatively quickly because it was Bondaweb and then cut with a die cutter. GS: So you have one of those, do you? KS: Yes, yes and as I say like the one we’re talking about and a computer to be able to print on fabric. GS: That’s marvellous. Can you describe the studio or the space in which you work at home? KS: Yes, I live in the centre of York in a Victorian house, three storeys, the top floor is a very big room, it’s the biggest room in the house so it’s the full width of the house and it’s more or less the full depth of the house. The disadvantage is it has a very steep staircase, a really steep staircase up to it and so it’s not practical to use as a bedroom, but it’s a fantastic room to use as a sewing room. GS: It sounds it, yes. KS: So it’s very light, the disadvantage is it does get very warm in summer but it is… and it’s great because I can sew up there, come down the stairs, I can close the door and the rest of the house is reasonably tidy and doesn’t have pins and needles. GS: And do you have a design wall up there? GS: So how do you balance your time? You’re involved with the Quilt Museum? KS: Yes, I am What I try to do is, I do like entering, doing work for competitions or challenges and so what I try to do is a couple of months before that actually set aside some time to be, to be working on that so that I’m not pushed at the last minute. And I will look at things, cut them out and then start sewing. I very rarely don’t have everything cut out to start with, to start with, so I tend to cut things out, then do the sewing and then probably go back and do some more cutting out. GS: Do you draw your designs on paper first? Or how do you actually get to your design? KS: I get to it mainly by trial and error so I make up some blocks. I will sketch things out on paper. I don’t tend to make very arty quilts; I’m not a person that would make very pictorial quilts cos I don’t have the artistic ability to do that. But if I do want something like that it’s probably a trace from something else and a blow-up. And maybe get a big full-size piece of paper and just put elements down on that, but I don’t meticulously plan on paper everything to start with. KS: A lot! [Laughter] Far too much. GS: Can you estimate it at all? KS: Ooh, no. I have to say that do enjoy, I’m a book person, so I’m a sucker for any form of quilting book if it’s, so I probably spend more on books than fabric [laughter]. GS: Even though you can get books in the library. KS: Even though I can get books in the library [laughter]. And actually it’s working in the library, sometimes I think actually I’d like that for myself. It’s not just quilting books, its books. So I probably, given that I don’t work and I’m not of pension age yet so I’m a kept woman I spend more than my income I spend more on quilting than I actually earn. [GS: Yes.] KS: Quite some number of hundreds of pounds a year. Yes. GS: It’s too easy isn’t it? KS: Yes it is. It’s very easy to be tempted. GS: It is, indeed. What do you think makes a great quilt? KS: For me it’s the visual impact. So if I have, just for me personally rather than judging quilts, if I have two pieces of work in front of me, I would always go for the one that had the best visual impact, rather than the one that was technically, technically perfect. So if it’s someone’s first piece of work and the points don’t meet and it’s a bit wobbly, but it looks fantastic I think that’s the piece that I would go for rather than something that is absolutely meticulous, but perhaps a little flat, yes. GS: So what makes a quilt appropriate for the museum, for the special collection? KS: I think The Quilters’ Guild has a really good mix because it has pieces in it which are visually stunning in both the heritage and the contemporary collection. I think the fabrics themselves are terribly interesting in a lot of them and the stories behind some of them are absolutely, the stories are absolutely fascinating. [Noise interference] And I think in the contemporary collection, most of those are visually stunning and fantastically made as well and for me I think that’s correct for our contemporary collection because I think we should be collecting either quilts from a particular person or quilts with a story. And I think the everyday ordinary quilt, I’m not really sure that we should collect those in the museum, so I think the collecting policy, yes, quilts that you would see in a normal quilt show I don’t really think belong at the moment in the museum collection… in great numbers. GS: Yes. And what would you say makes a great quiltmaker? Who are you particularly drawn to? KS: I love, as I mentioned earlier, I love the North Country wholecloth quilts and I do have a collection of those which I use and I give talks and they go on exhibition and, I think, all of those have been made by great quiltmakers, but I don’t actually know, apart from three of them, who’s actually made them. So I have about fifteen, most of them I don’t know but I think all of those were great quiltmakers. I have bought them because they look fantastic, they are beautiful, not all of them are the best stitched ones but they’ve been made either as a gift or they’ve been made for people to earn a living with or they’ve been made as wedding presents or there’s a story behind them and I think they’re great quiltmakers. And then the quilters that I, the contemporary quilters that I particularly like, I love Sheena Norquay which I think everyone loves Sheena Norquay, and I love the work of Pat Archibald. And I like those for two different reasons, one is, Pat’s are very, lovely quilts to look at, but they are actually as she herself says, they’re very simply made, they’re not something that other people couldn’t make, but she always has ideas that other people don’t have. And Sheena’s I love because they’re visually stunning, they’re fantastic and they’re something that I would never ever, I just know I don’t have the skill to make work like that. And the other people I like are quite often professional quilts, I will come across a quilt or a wall hanging that I just think is fantastic and I’ve never heard of, never heard of the person that’s made them. So I think there are some really great quiltmakers out there that nobody nobody’s ever heard of and they’re just wonderful people and work, yeah. GS: You’ve mentioned that, we’ve talked previously about hand quilting and machine quilting, and you say you really don’t feel you can cope with double bed quilts on your machine any more, but what about longarm quilting how do you feel about that? KS: Oh that’s what I’ve done with the ones that I don’t want to quilt myself I’ve sent them to be longarmed and the ones that I have done, I’ve got two on the beds at the moment have been longarm quilted and I think that’s, I think that’s great, yes. I’d love to have a go myself, Yeah, I think that’s would be a great a great skill and the people, like Chris Marriage, who win prizes for doing it just have so much, so much skill. GS: Why would you say quiltmaking is important in your life? KS: And to be able to have them in two or three sessions make something that they’re happy with and then see them and have a life, a life of enjoyment from it. 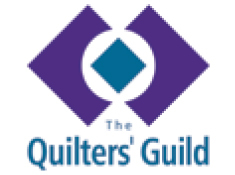 And I also think that it engages people on a number of different levels, as we mentioned The Quilters’ Guild, I’ve been involved in helping run The Guild and I think that’s a great thing to do as well. GS: Yes, absolutely. And you mentioned a little while ago that you enjoyed making challenges and you’re about to send one to Finland. In fact you’ve won prizes with various challenges, haven’t you? KS: Yes, well, somewhat as a surprise, yeah. I, with a couple of friends entered the group section of the Loch Lomond Quilt Show and I always used to, I do send things to exhibitions, because I think that if people don’t send things, there’s no exhibition to see. So I always send things and I encourage other people to send them, never with the expectation of ever winning anything and I always say to my husband if I’ve sent something to a competition and I’m going somewhere if they ring to say I’ve won the first prize tell them I’m there to collect it because I just know it will never happen. And so it was a great, it was a great surprise that the piece that we entered in Loch Lomond, I had an email saying ‘you’ve won first prize’ and at first I thought it was a joke [laughter]. 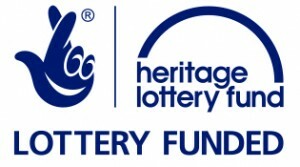 I thought it was yeah, the friend, one of the friends I made it with, there were three of us and one is a really good friend and I thought it was Margaret winding me up until I saw where the email had come and so, yes, I was really very surprised and really pleased to have won that. GS: Yes, excellent. Would you say that your quilting reflects your community or region? KS: Yes, in some ways. I mean one of the other things, the other pieces that I made and that I now don’t have because again it’s gratifying that somebody wanted to buy it, was for the Quilt City project in York. And I made a piece which reflected where I lived and my interest in history as well as quilting and so I try to, I do try to relate things to either something that I’ve seen or something, yes, something local, somewhere I’ve been on holiday. I’ve just been on holiday to Sicily, took hundreds of photographs of the floors and think I now need to make a Sicilian floor, a Sicilian floor quilt. 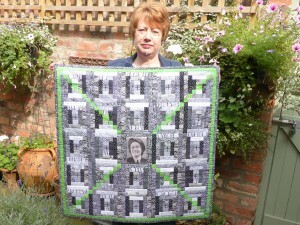 GS: What about the importance of quilts in British life as a whole? KS: I think it’s becoming more important. I think that perhaps quilting has been seen as the lesser of the needle arts and embroidery has had a much higher profile and a much higher status. But I think that the opening of The Quilt Museum, the fantastic exhibitions at the V&A of quiltmaking has raised the profile of quiltmaking. And I also think that the movement towards more art based quilts, which wouldn’t necessarily appeal to everyone, but I think it gets textile art, i.e. quiltmaking out in the public arena and in places that would never, like the Bowes Museum, would never have had a major, and the V&A, a major exhibition of quiltmaking, now have them and they attract lots and lots of people. GS: Absolutely. 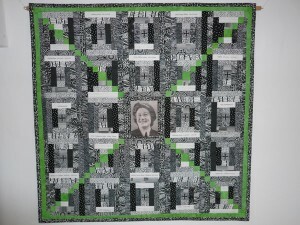 Which ways do you think quilts have special meaning for women’s history in Britain? KS: I think it’s been a very hidden history and I think because, although historically quilts would have been made by men in Georgian times, but more recent history, it’s been women’s history, it’s been made for use rather than art and unfortunately women’s history in the early part of the twentieth century was for a lot of women, they weren’t valued, their work wasn’t values if it was something that they did with their hands unless it was Fine Art. So I think it’s been great that it has raised the profile of women as craftsperson, artist to the same level as men. So much so that men are now making quilts, you know there a number of men, I think it’s different in America, they don’t, in this country I think it’s great that now there a number of men who are becoming well-known. They’ve been weavers, they’ve been artists, and they’re seeing 3D textile work as their preferred expressive medium. GS: Now you’re obviously interested in saving quilts, preserving quilts for the future. Do you do any conservation work yourself? Are you involved in that at all? KS: I do, I have a quilt of my own that I’m trying to conserve because it’s gone a bit raggy, but I come in as a volunteer at The Quilt Museum and help with the Heritage Collection behind the scenes, doing some, doing some conservation there and some documenting of the quilts and helping photograph them. And I think the heritage quilts are really, really important because they were used and they were thrown away and even people that make very art based quilts, their tradition and their technique is the traditional techniques that they need to build on. GS: Yes, exactly. What’s happened to the quilts you’ve made for friends and family? Do you know? KS: Yes, in that it might be slightly selfish, but I have only ever made work for people that I know will use it or value it. So I know friends will make a quilt for friends or family and then they don’t get used, and I think, no if I’m going to put all that time and effort in. So I have made quilts, I have made bags and I’ve made cushions for friends for particular anniversaries and we have some very good friends who I’ve made small pictures… a walking friend of my husband, I made a landscape of the hills and I’m really pleased that every time we go, it’s still out and it’s in the same place. So yes they’re not just getting it out because we’re going and they’re being used which is what they’re made for and if they get worn out and they get damaged it doesn’t matter, but at least they are being, they are being used. GS: What would you say is the biggest challenge confronting quiltmakers today? KS: Ooof [laughter]. Time, yes, I think time for everyone to be able to make it and still even now, confidence. I think for the novice quilter to have the confidence to just have a go and do it and to be pleased with what they’ve achieved, to go to the shows to come to exhibitions and look at other people’s work, but for it not to be daunting and for them to value themselves. And I still think that there’s an issue of people not valuing their own work. Yeah but definitely time [laughter]. GS: Thank you very much indeed Kate, that’s all my questions and it’s been very, very interesting. KS: Well, thank you for inviting me to be part of the project. Thank you.